While I love the simplicity, accuracy, and reliability of my PowerTap G3 power meter hub, I would very much like the flexibility of swapping wheels and tires at will, especially as I change bikes often depending on the conditions, season, and route. Namely, I really wanted a power meter that I could swap between my road bike and my cross/winter bike, but I didn't want to shell out over a grand for Vector or P1 pedals. After consideration, the Stages crank arm power meter seemed like the best option. This is possible because I've made sure both my bikes have the same length crank arms (170mm) and spindle type (GXP). However before I start relying on the data from the Stages, and setting my FTP and sprint targets based on data from the new left-side only power meter, I thought I'd conduct a little experiment to compare the accuracy of the power meter readings. I don't pretend to be anywhere near as thorough as the DC Rainmaker Stages Power Meter In-Depth Review but it was still quite illuminating. Read on to find out what I discovered. A few things are immediately apparent from the GoldenCheetah power data graphs. First, there seemed to be some time drift between the Wahoo Fitness app on my iPhone 4s and the Garmin Edge 800. Not sure who is the culprit there, but the activities drifted about 2 seconds apart over the hour. The Stages data at the crank arm is shown in magenta on the graph, while the PowerTap G3 data from the rear hub is shown in cyan below. So, let's line up some segments of the ride to minimize the drift. It's easy to see that the Stages crank arm power meter is reading consistently higher watts versus the PowerTap G3 hub. It's also apparent that the G3 data is more fine-grained, which makes perfect sense when you think about it; since the Stages is left-leg only, it therefore has to double it's readings to approximate the output for both legs, and therefore halve the resolution or frequency. Part of the difference probably friction loss in the chain or rings. The bike is moderately clean, but the chain could have used a lube. But, I think the bigger reason is that my pedal stroke is not ideal. Keep in mind that the Stages is left side (non-drive side) only and doubles that figure, so if the trailing leg (right or drive side) is not completely unweighted on the up stroke, the left leg will have to apply more force to compensate - wasted power that is seen at the crank, but is never transferred to the rear wheel where the G3 hub is measuring. When I made a very conscious effort to unweight my legs on the up stroke, the numbers lined up much more closely. So, that's one area that I definitely have to work on, and be mindful that it will effect the results. On the plus side, it means I should be able to go quite a lot faster for the same effort if I just optimize my pedalling style. Which measuring method is "better" in this regard? Well, the Stages is more accurately measuring the effort that I'm making, so it should be more accurate in terms of calories and workout intensity. But if the power isn't making it to the back wheel, it's not propelling you forward; consequently the G3 would better for comparing absolute speed between riders, i.e. the Coggan power charts to see where your W/kg stack up against other Cat 1,2,3,4 riders. At any rate, I'm excited to finally have power on my CX bike, and to have power numbers AND be able to use my nice rear Dura-Ace wheels at the same time. I've become a big fan of the PMC chart this winter, and now I don't have to make guesses about any more stress scores. If I really work on my pedal stroke over the 2016 season, I can always do the test again and see if the numbers are any closer together. I suspect they will be, as the DC Rainmaker tests showed a very minor difference between the Stages and G3 - and I suspect Ray's pedal stroke is a lot smoother than mine! Thank you for this article. I have exactly the same set-up on 2 bikes. I've been riding with the G3 much longer. I "feel" like the Stages gives ~10% higher readings at high/sprint power, and ~10% lower for average/most power levels (which really bothers me!). I was thinking of doing exactly the same experiment as you but my question is though, if they genuinely don't match, can I adjust the Stages at all?? Hi Richard, welcome to the forum! 10% would be a big difference for sure, but there are a lot of things that can influence the results since the two meters are measuring power at different places. First - have you calibrated the two power meters correctly? If there's any temperature difference between where you store your bike and where you ride, you should do a calibration 10 minutes after taking the bike out to let the meters adjust. 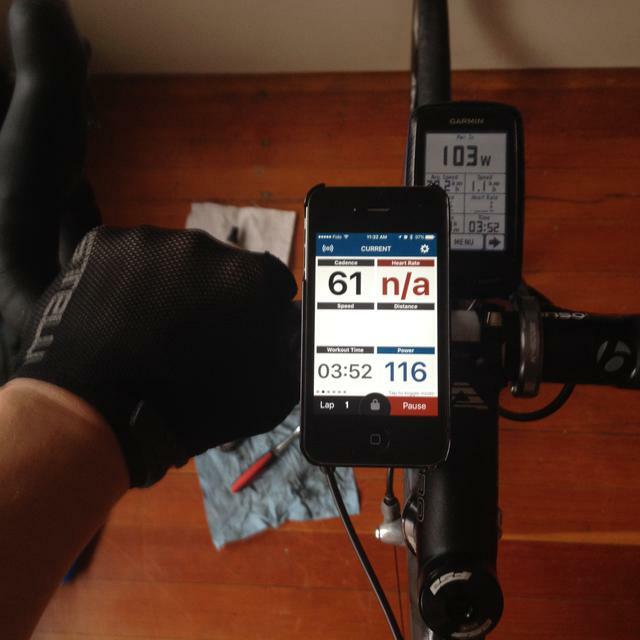 I calibrate my PowerTap G3 hub over ANT+ with my Garmin from the sensor pairing screen. You should be off the bike, eg no load at all on cranks or anything else. For the Stages, I use the Stages app on my iPhone over Bluetooth to calibrate. Both meters should auto-calibrate, but you should do it manually to verify there's no strange calibration results (e.g. 0 or 999 or some other odd value). I would calibrate each meter three times, and check that the results are all within a small range. Since the Stages measures at the crank and the G3 at the hub/wheel, any friction or problems on the drivetrain can easily be losing watts. As I mentioned in the first post, if your trailing leg (on the upstroke) isn't fully unweighted, your driving leg (on the downstroke) is going to be "fighting" that leg. The Stages will read higher power, but that power isn't going to the back wheel; it's working against your other leg. Also, since the Stages is left-side only, any left/right imbalance will magnify the difference in results to the G3 hub, which gets power from both legs. It's possible that this could explain the difference between your seated and sprinting power measurements. Hard to tell. Anyway, that's all I can think of! Hope it helps, let me know what you find. It's pretty rare that the G3 or the Stages just give completely wrong power values, these two meters are pretty much the "gold standard". They go through a lot of QA, but keep in mind the error tolerance (accuracy) is 1.5% for the G3 and 2% for the Stages, so if by coincidence you happen to get one reading +1.5% and the other reading -2% that would give you almost a 4% difference right there. Thanks Skye - I actually forgot that I'd posted this and I wanted to come back and report. I had a happy winter training on just my training bike with, what I assume to be my accurate Powertap G3 hub. And I had a happy spring & summer mostly riding & racing outside with the Stages and didn't care too much about the perceived difference. Until I just started to think about fall/winter training again recently and comparing critical power points in workouts. I sometimes got pretty irritated because I was convinced that the Stages was reading ~10% under the PowerTap. I expect both are "accurate" and basically convinced myself (with little evidence) that I have a right-side bias that is skewing the Stages output (that is possibly leveled out during short standing max sprint efforts). Anyway - so I put the Stages on the same bike as the PowerTap hub and did a proper comparison. I connected the Stages to my Garmin as normal and connected the PowerTap to Zwift (i.e. my laptop) (also pretty normal) and did two Zwift 4-wk FTP builder workouts back-to-back (wk2-days 2 & 3) to give a really varied range of efforts from just tempo to max efforts (not really flat out sprints as I can't on my turbo as the wheel slips), and create some fatigue! Result - they are almost exactly the same - to within <1%! To be honest I was shocked how similar they are! (I was going to show a comparison graph but they're so close it's pointless (the Stages is a little more spiky - perhaps what you'd expect from a crank vs. hub reading). I now think that my basic problem is that my heart-rate and perceived effort is higher when I'm riding outside vs when I'm on my trainer in my garage. So it's me I need to fix - not the Stages PM! Btw - this study (Sports Med Phys Fitness. 2007 Mar;47(1):51-7) shows a 13-17% leg power imbalance is pretty common, even in well trained cyclists - and indeed that the difference is reduced at harder efforts. (There are other studies that show that this imbalance actually changes from day-to-day - likely with differing levels/types of fatigue). To be honest, this makes me doubt the whole philosophy of a left-sided only crank although I guess it's all relative and training zones can be set either way! I'm planning on getting myself on a gym Wattbike to test this too but so far looks like I have a different problem! thanks again for getting me thinking about and testing this! p.s. I thought that both Powertap and Stages self adjust for temperature? (I never adjust after 10 mins on the road - although the PowerTap mostly doesn't move from the garage as it gets used mostly on the turbo). I usually do Garmin calibration of both before I ride. Post a reply, start a new topic, join the conversation!